is a New York-based illustrator with a great interest in all things furred, feathered and scaled. He is an ardent conservationist and a proud collaborator with many organizations working to ensure the future of wild places and threatened species, especially within Southeast Asia. His work has been shown internationally and regularly appears in McSweeney's weekly section THE GOODS. Brendan is a graduate of Pratt Institute and is the son of illustrator David T. Wenzel. He currently lives in Brooklyn with his partner Magdalena. #1. David Attenborough - that guy is amazing. Jane Goodall and EO Wilson. For art, Quentin Blake, Leo Lionni, and Alice and Marten Provensen, Ben Shanh and Sidney Nolan to name a few. Favorite project you have done so far? Last year I collaborated with Fauna and Flora International on a media campaign to raise awareness within Cambodia about the plight of the critically endangered Siamese Crocodile. Besides from helping secure that species future in the region, part of the campaign also involved creating a children's book for kids in rural Cambodia. It felt really good to get that out there. What would be a dream project for you? Working on a book for children with David Attenborough. Preferably this dream book would include a photo of the two of us shaking hands in front of some sort of really dangerous animal. My favorite webpage is the site for the IUCN redlist.http://www.iucnredlist.org/. Its not the most fun site in the world, but It enables you to search the conservation status for any animal on earth. I'm on there about nine times a day, so I guess that'd have to be it. 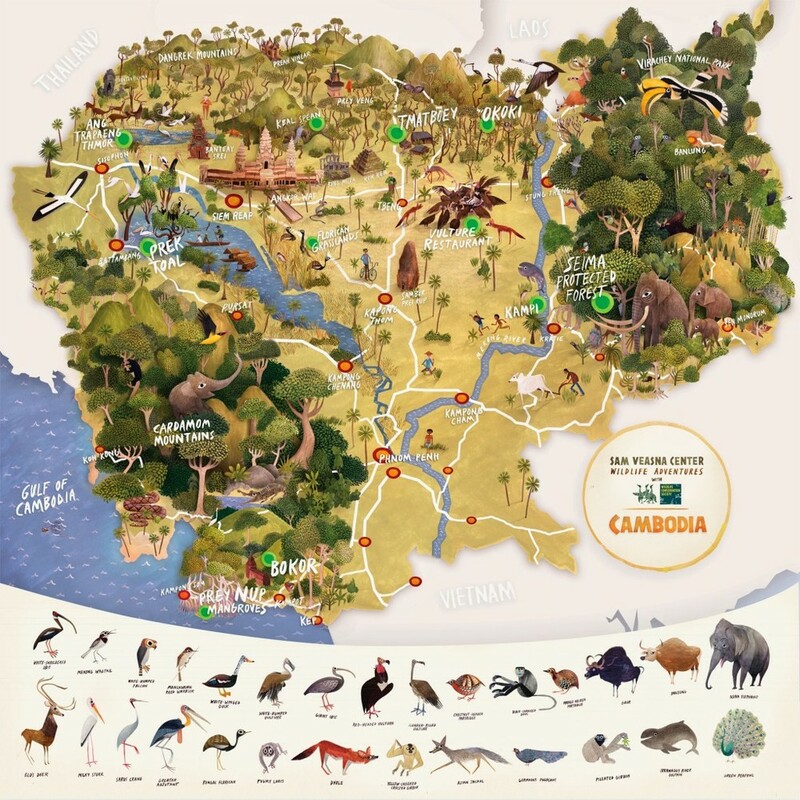 Tell us about the Vietnam wildlife project you are involved with. The original images for the wildlife of Vietnam project were created while I was living in Ho Chi Minh City for 2008-2010. The original goal was to draw some attention to the plight of biodiversity in the region. The animals in that part of the world are in some real trouble. The demands of an ever growing illegal wildlife trade and rapid development have created a perfect storm, and the unique roster of creatures found within the country are being wiped out faster than most would believe. Pretty devastating stuff. I wanted to create something that would simultaneously speak to both a western and eastern audience, and maybe inspire a few people to learn more about what is unfolding in the region, and think about what we all stand to lose if these creatures disappear. The images have also helped me to connect and collaborate with a lot of likeminded people who are doing, fantastic work in conservation in Vietnam and Cambodia, and elsewhere around the world. I have been really grateful to have that opportunity.